Informal and unorganized garbage disposal is major emerging problem as well as a business opportunity of increasing importance, given by the volumes of waste that is being generated and the constraints of both toxic and invaluable materials in them. Solid waste management, which is already a mammoth task to be overcome in India, is becoming more complicated by the incoming of another kind of garbage called e-waste, particularly computer waste. E-waste from developed countries find an easy way into developing countries in the name of free trade (Toxics Link, 2004) is further complicating the problems associated with waste management. The paper highlights the associated issues and strategies to address this growing problem, in the sight of initiatives in India. Briefing the topic, as suggested by the reports of the committee constituted by the Hon’ble Supreme Court of India in March 1999, the lack of financial resources, inefficient institutional arrangement, inappropriate technology, weak legislative measures and unawareness in public towards solid waste management has made the service most unsatisfactory and inefficient. We will get to know about this issue better as we move ahead. According Municipal garbage Management and Handling rules -2000 , solid waste management is in the obligatory function of urban local bodies , but in actual practice the solid waste management is given the last priority and the duties are either not performed or poorly performed consequently the city has to face numerable problems related to environment and sanitation. The garbage generation in small cities is lower than larger cities. The rate of solid waste generation is also directly related to the economic status of families. According to the studies conducted by Tata Energy Research Institute, higher income group generate more solid waste than middle and lower income groups. The lower economic income societies in New Delhi generate less than 1/3rd of solid waste than their higher income counter parts. In smaller cities of population about 3 lakhs. The generation of biodegradable waste (50 – 65%) is more than non-biodegradable waste (35 – 50 %). The organic matter in India solid waste is higher, due to the presence of a large percentage of vegetative matter. This is attributed to the fact that Indians eat fresh vegetables and fruits in contrast to the consumption of tinned / pre – cooked food in developed countries. The solid waste management approach in India is extremely in-efficient, using old and obsolete system, technology for storage collection processing, treatment and disposal. There is no formal organized system of segregation of biodegradable and non-biodegradable solid waste. The recovery and recycling of waste is only done by scavengers and scrap dealers which is highly hazardous to those which are involved in this job. In most of the cities in India, the scientific and systematic storage of waste at source is not in practice. 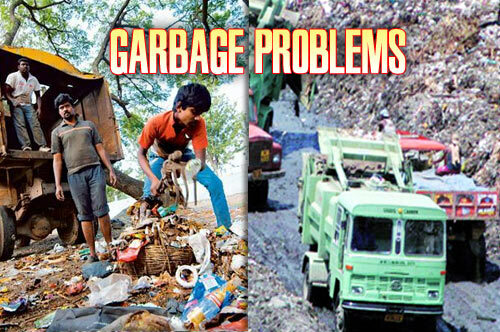 The waste is normally deposited in nearby vacant areas, government vacant land, drains, streets etc. Because of waste thrown on the street the environment becomes ugly and unhygienic, so even in case of regular cleaning be Municipal Workers. The city is not being kept clean for more than 2-3 hours. At some other places people generally don’t arrange to provide proper dustbins, in residential, institutional and commercial areas. In case of open drains and large drains passing across the city, people throw waste and these drains are clogged, width of large drains are reduced because of continuous dumping. People generally use items like, to collect waste at source: buckets, polythene packets, plastic bins, metal bins with and without lids.